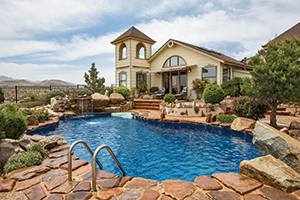 Two and-a-half decades ago when Dede and John Erceg bought five acres on a hilltop in Chino Valley, they didn’t buy it for the 70s-era farmhouse-style home or the abundance of wildlife nearby. They bought it for the views. One day while they were on a motorcycle ride, they spotted the property, five acres with 360-degree views comprising the San Francisco Peaks, Granite Mountain, and Table Mountain … and, of course, the Arizona sky and its beautiful sunrises, sunsets and cloud formations. For the Ercegs, who have known each other since childhood, and who love camping, bicycling, and just being outside, it was perfect. They bought it right away. Then they set to work on making it theirs. Dede said they slowly started knocking out rooms, and every few years they’d add on another section. The result: a stunning, energy-efficient 4,300-square-foot, three-bedroom home that succeeds in bringing the outside in, in more ways than one. The home’s entryway features tile and flagstone flooring and a koi pond, and generous windows let in the light. John finished the ceiling in a pattern meant to mimic the wheat in the nearby fields, and countless houseplants clean the air and lend an outdoorsy feel. To the right, a short, bright hallway (from which the home’s moat is visible through floor-to-ceiling windows the Ercegs installed) leads to the living room, which is lush with a variety of plants. To the left, a wide staircase leads to the home’s two guest bedrooms and a rec room. And straight ahead sits Dede’s office, which features flooring and cabinetry made out of cherry wood from back east. John explained that the wood from the cherry trees is harvested when cherry farmers cut down older trees that stop producing. They’re constantly replanting their orchards, so the harvesting and sale of the woods is almost like a recycling process. “We love recycling,” Dede said, pointing out old post office drawers taken from the post office where John’s grandmother was postmistress. Just past the office is the kitchen, framed by pillars made from the trunks of local Ponderosa pine trees that were cut down after the bark beetle infestation. With generous granite countertops, a six-burner range, and a double oven, it’s the perfect place for Dede to cook (which she enjoys). A wide window over the sink showcases the saltwater pool, which is surrounded by a beautiful landscape rich with evergreen and perennial plants that attract birds, butterflies, and even a family of owls. An umbrella with lights and misters—converted from an old satellite dish (another recycling project)—provides shade at a poolside table. Down a spiral staircase, Dede has cultivated a garden, featuring more than one hundred varieties of iris as well as vegetables, in raised beds. And John grew up building alongside his grandfather on his homestead in Sheep Ranch—so he’s put his skills to use laying flooring, installing cabinets, and building rock walls for the garden. Many of the projects were family-centric; Dede said she remembers John and their daughter cutting the flagstone for the pool patio when their daughter was a child. During the cooler months, the sun heats the house in the morning, and it stays warm most of the day (they use a wood stove to supplement when necessary). And during the warmer months, the Ercegs circulate the cool air from downstairs to minimize their use of the whole-house air conditioner. Their electric bills are less than $1,000 per year. And the house is unique—it’s them: “We built it to make us happy,” Dede said. Dede and John met when she was five and he was ten and married when they were 19 and 24; they lived in Northern California and moved to Prescott to attend Embry-Riddle Aeronautical University. John retired after a career as an airline pilot and captain, and is now a home inspector. Dede managed a grocery store for years before becoming a Realtor.